It has been an eventful year, 2015. 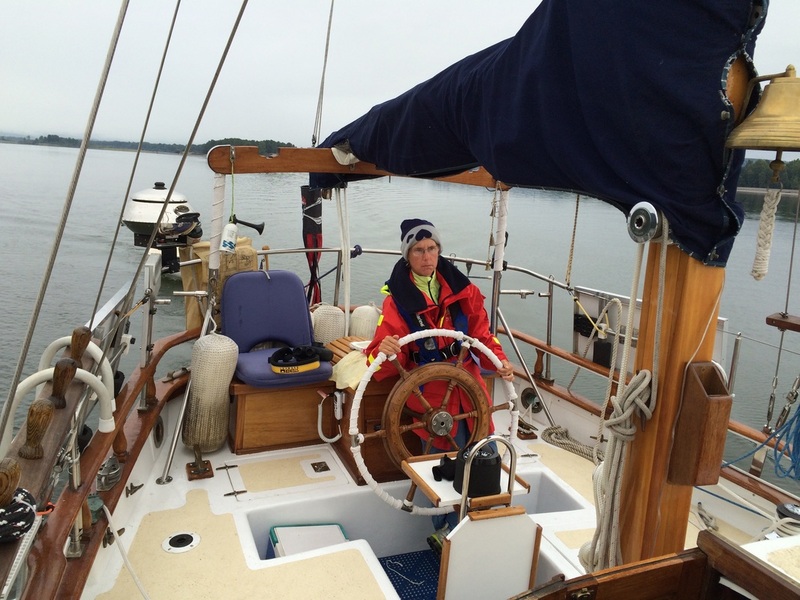 This Summer, Moontide taught us much about herself with our little forays away from the dock. Now we understand and appreciate more of her qualities, and are learning something of her weaknesses. ​This is the year the skipper turned 60! Now how the hell did that happen?!?! This Fall, we lost our dear Carmen. She was almost 14 years old. She had a good life. She was a good friend. She was family. In October, Gabrielle rescued Sophie, a sweet Tervuren Shepherd who is enough puppy to keep the crew busy trying to keep up with her! Our lives are filled with gains and losses, enriched in the end by how well we love and are loved in return. 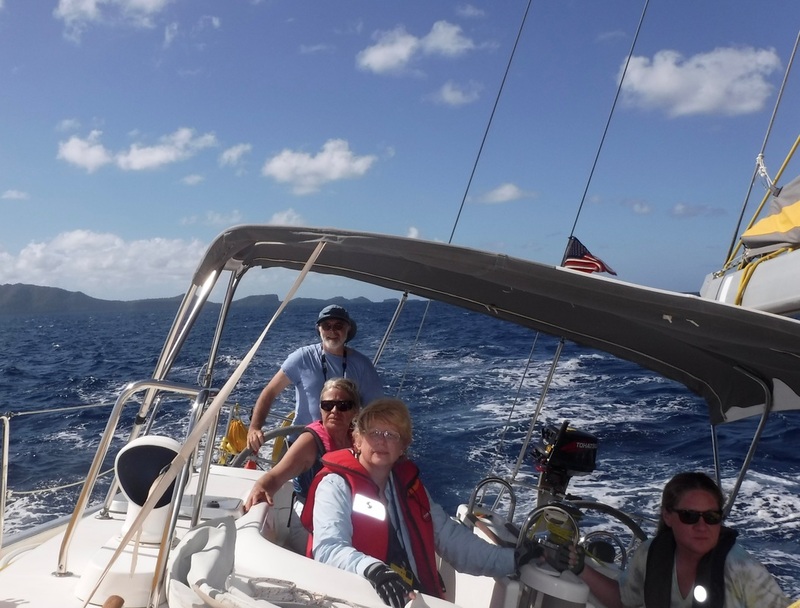 And since we are in no position to take our boat to the tropics right now, the Moontide crew opted to join 5 other adventurers on a bareboat charter to St. Vincent and the Grenadines. 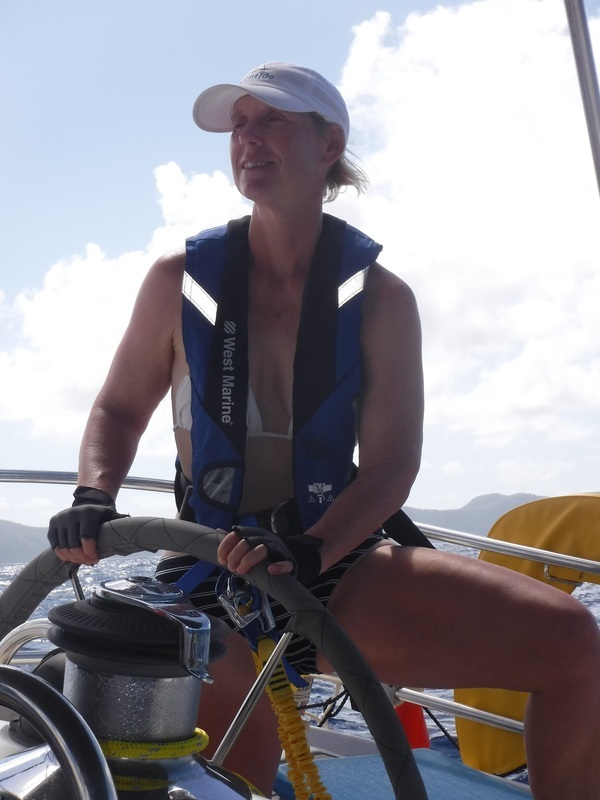 The eastern Caribbean, for 10 days of awesome sailing, swimming, and soaking in WARM water! 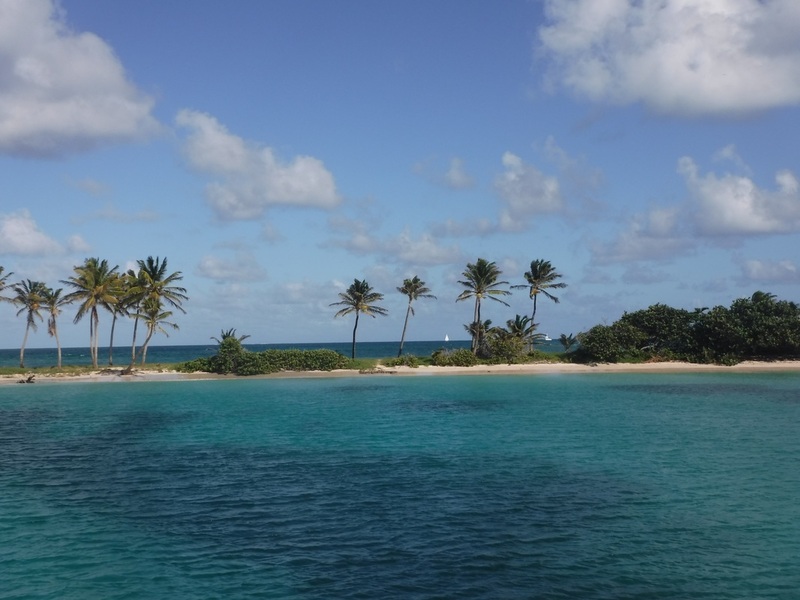 Sailing to Mustique. Yes, the water really is that blue! You may now be jealous. Hugs and wishes of health, hope, and happiness to all! ​May the New Year be kind! 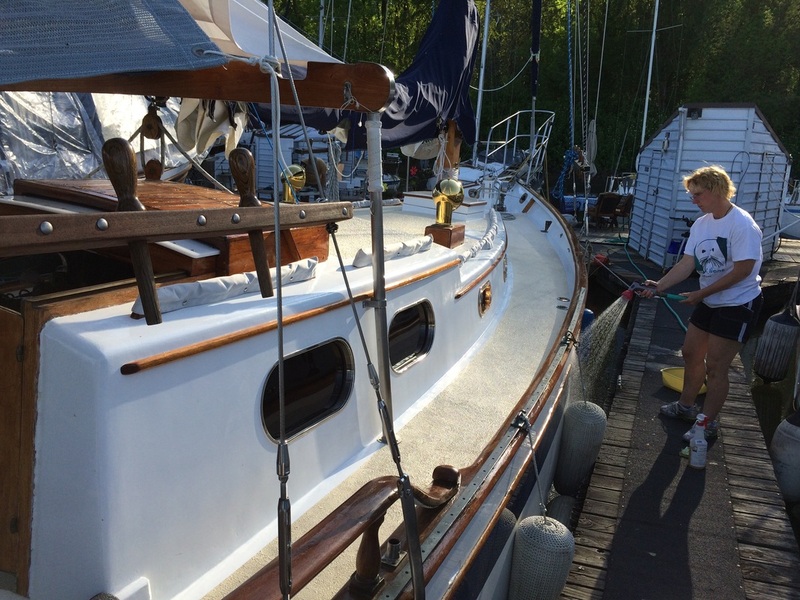 The Summer has passed all too quickly, and Moontide and her crew are winding down from efforts to take all the folks sailing to whom we’d given “rain checks” while rebuilding the boat. Gabrielle takes driving the boat very seriously. Bundled up, but having fun, she says!?! 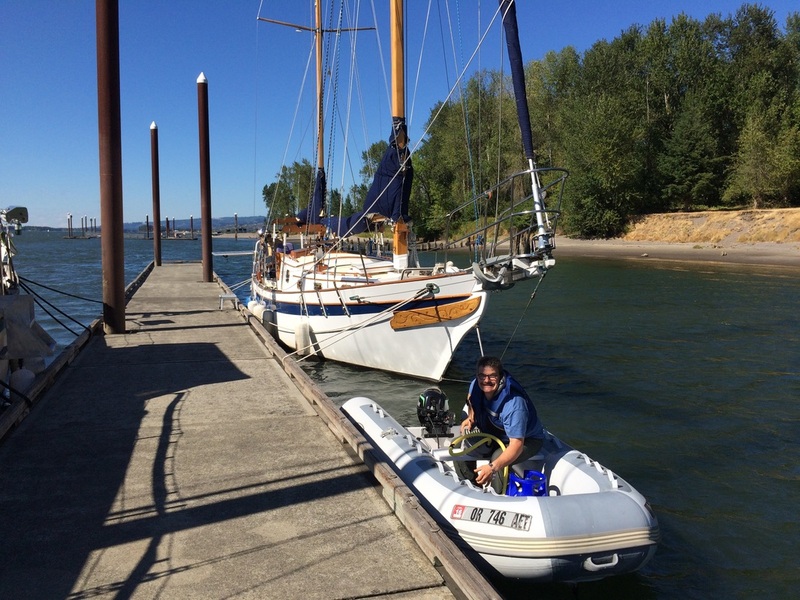 Dar Nelson, getting ready to dinghy folks out to the island from St. Helen's dock. Showing off our LED deck lights in the last light of a beautiful day. 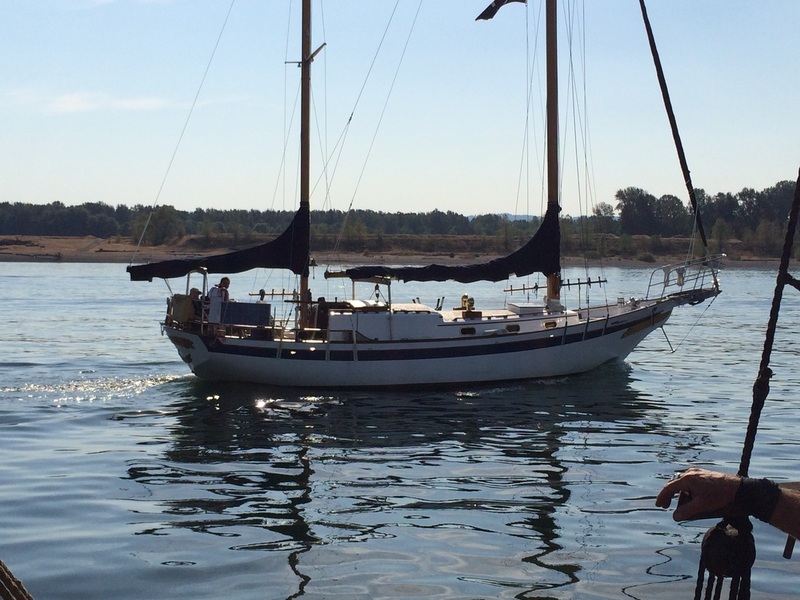 From an ‘armada’ cruise, sailing with the Nelson/Winkler clan joined us with their ‘mothership’ Toketee down on Sand Island on the Columbia, Moontide and her crew finally had some time on the water. 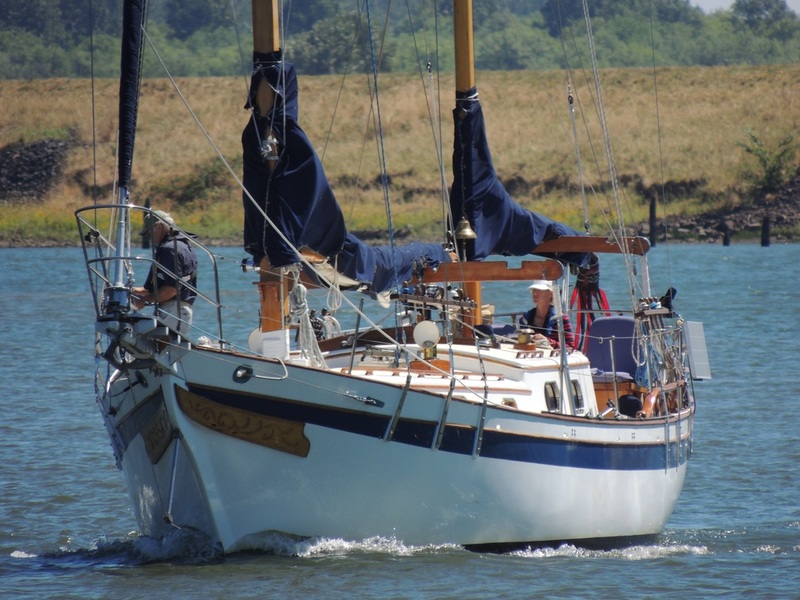 Including some fun daysails: Sharon Sparks, Noreen Grossnickle, and Michael Dowding with the “Dowding Orphans” reunion in August anchored on the Willamette River. With Rebecca and Nick Peck sailing on the Columbia under the I205 Bridge. Lots of clouds, and not much wind, but great company! 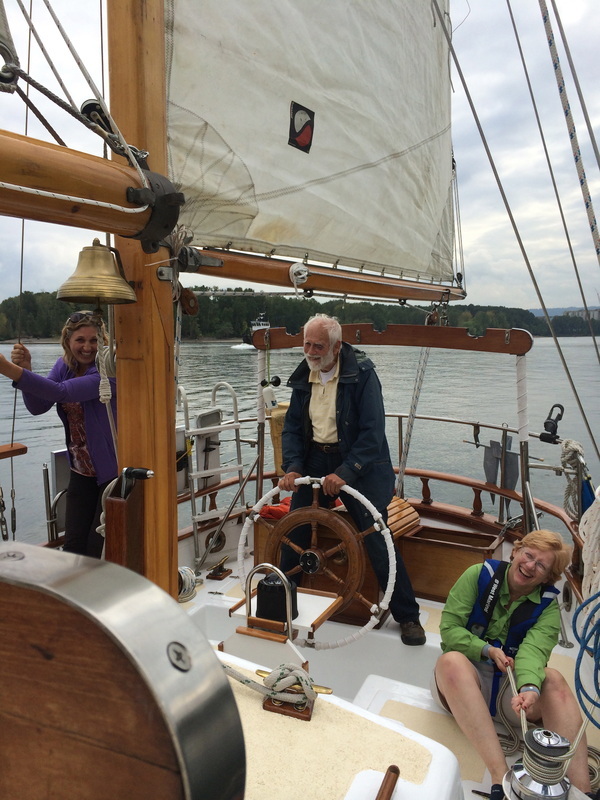 Hans Kerstetter helping to Crew Moontide back home to Pirate's Cove. 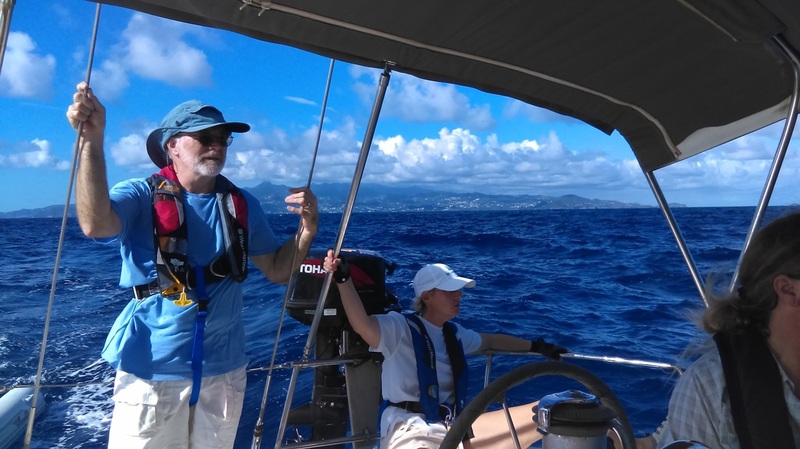 The Royaliste crew, (Shuhe Hawkins, Kate Larsen, & Mark Heimann shown here) took a day off from Pirating to just enjoy a sail on ​Moontide. 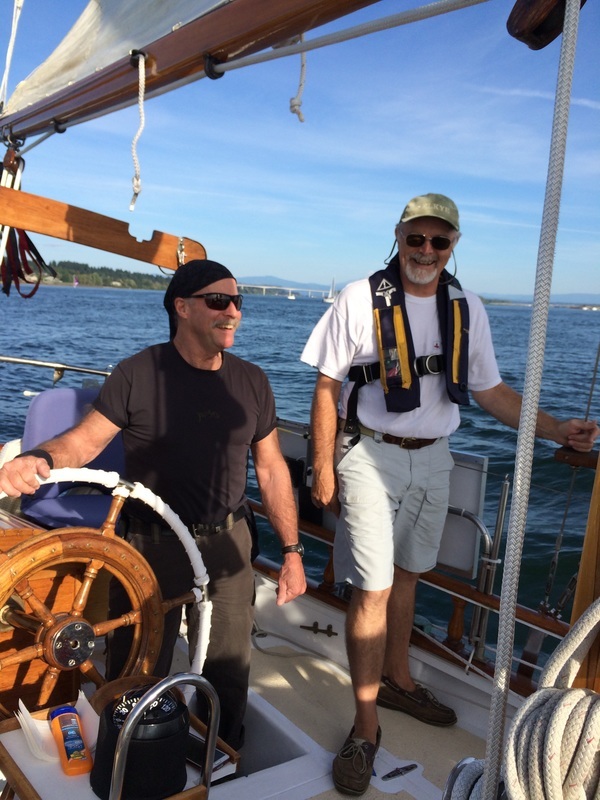 Mark Heimann and the skipper having a chuckle under sunny skies and light winds. Too soon we will be wrapping Moony up for the Winter. Last year Oregon had no Winter weather. Who knows what the El Nino will bring us? We'll keep you posted. 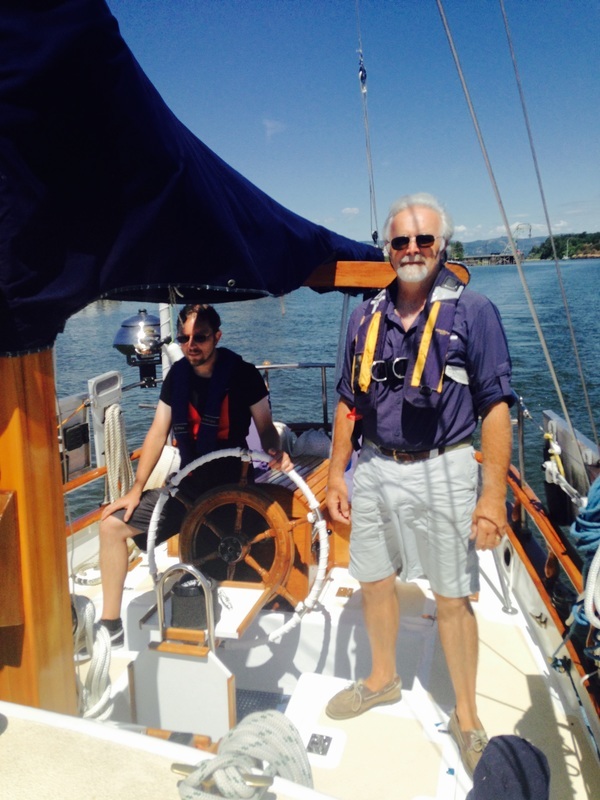 June has been an eventful month, on the Moontide, with some short trips along the Multnomah Channel, and two longer trips down the Columbia River to Puget Island and back. The first voyage down river was practice. 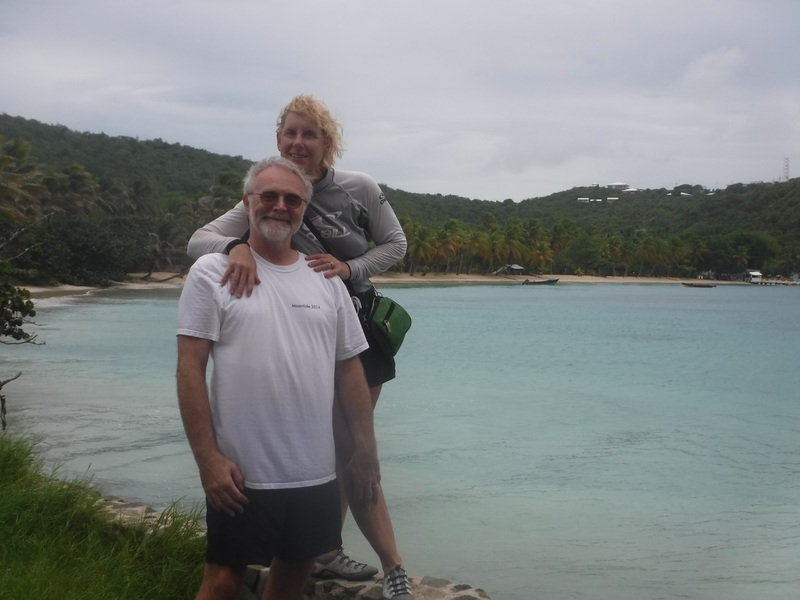 We had never been into Elochoman Marina, and since we were hosting the SIYC cruise-in for June there, (Gabrielle was appointed Vice Commodore of the club this month) thought we should know something about the place. However, getting there was a challenge. You see, there’s this thing called... Maintenance. One can defer maintenance for a day or two, but at the end of the week, there are still 7 hours of maintenance due the boat. This was something entirely different from boat ‘restoration’ which is rebuilding and updating structures. In our hours and hours of effort to make Moony structurally sound and beautiful again, we had neglected the regular maintenance she needed to keep her running. 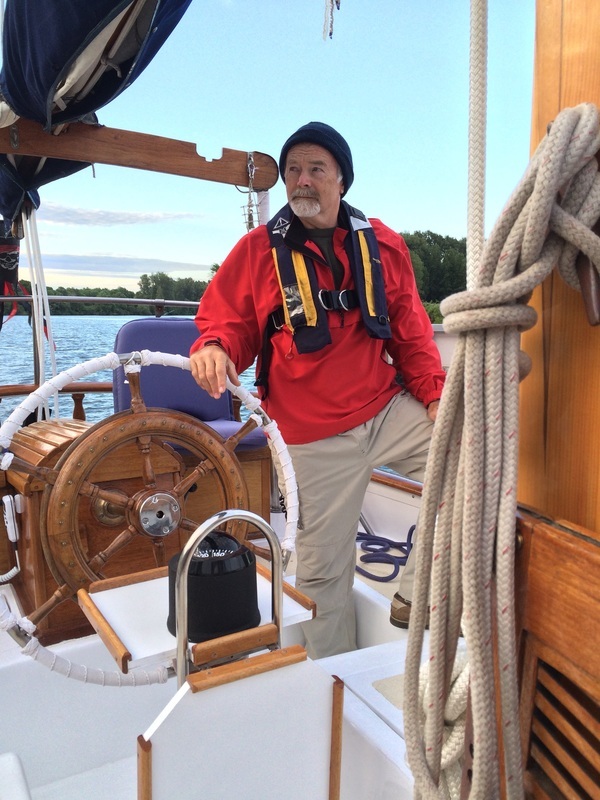 We discovered this first time out going down the Channel when Moontide overheated, blew a radiator cap, the windlass failed, the alternator stopped working, and the raw water pump started leaking. Embarrassed, and somewhat disheartened, we stumbled back home to Pirates Cove to figure out how long it would take to make repairs, and worse, how much it was all going to cost. Fortunately, repairs truly were maintenance issues and easier to complete than we feared. And (with a little help from our friends -- thanks Larry and Dar!) we were able to cast off again without incurring too big a bite from our limited cruising kitty. Lessons learned: Check your engine periodically for bolts and belts that can come loose with vibration. Keep your house and engine battery posts clean and fittings securely tightened to them. and make sure the radiator cap is the right one for your engine. Gabrielle, "hanging out" in the swing chair, enjoying a chance to catch up on her reading. 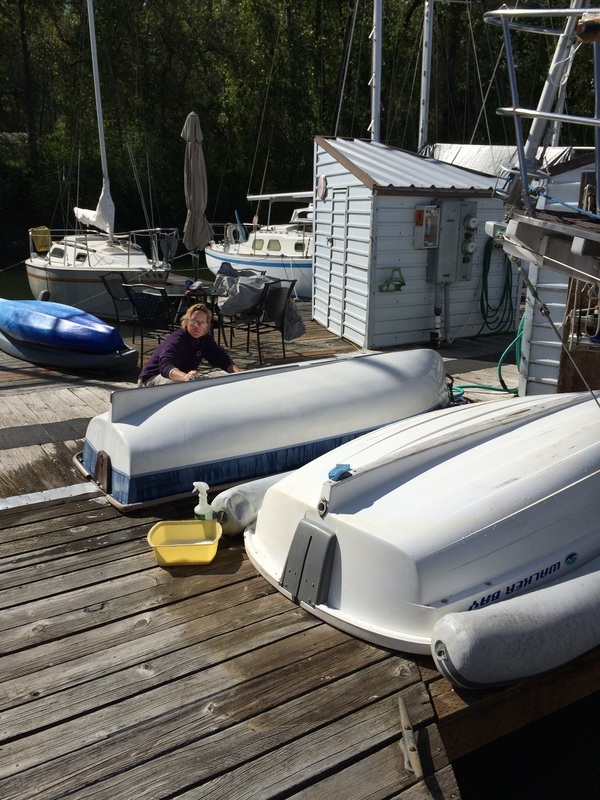 Some of the best parts of warm weather: The tarps come off the boats. 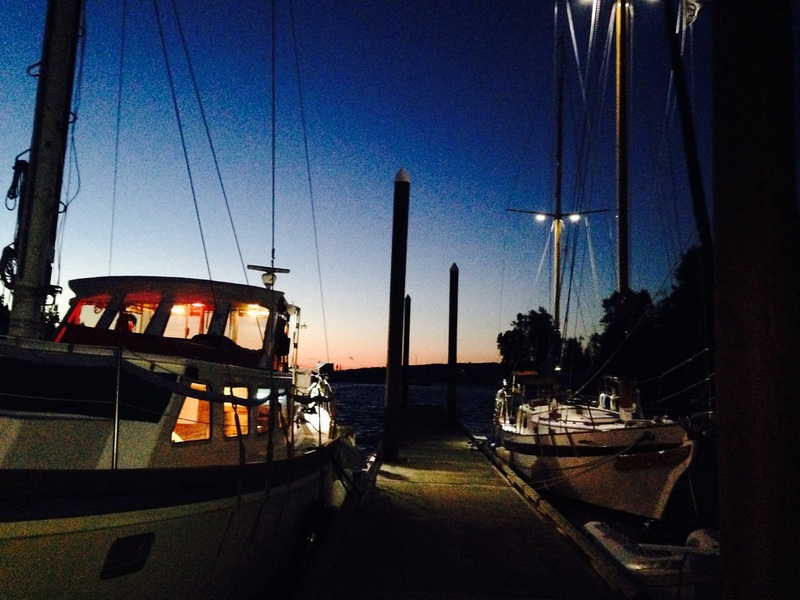 People reemerge from their Winter torpor inside, and the sounds of conversation and laughter can be heard once again on the dock. Cold weather clothes are stowed, and warm weather clothes are donned. Rigging gets checked and prepped for sailing. But nice weather also means our excuse for avoiding outdoor projects is gone. Time to get out and work on the boat! 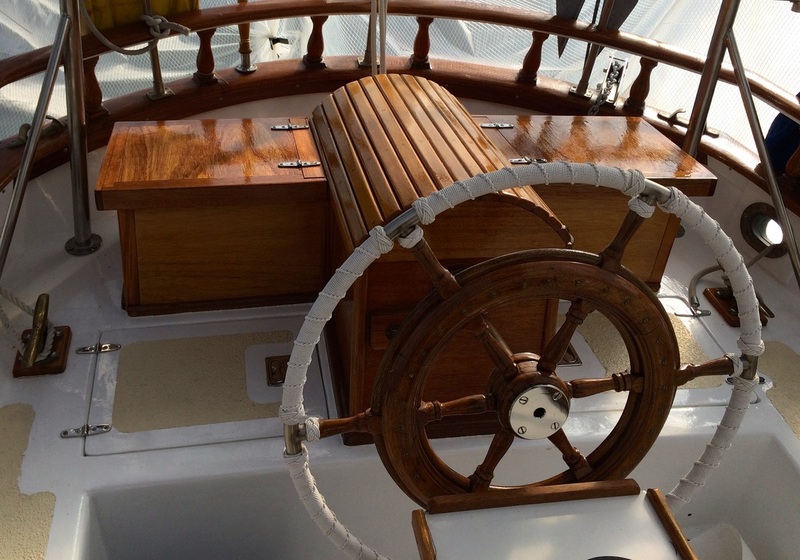 For those of you who follow our Restoration section on the SVMoontide website, check out 2015. You can see there that our major Spring project has been cutting holes and installing the last four deadlights on the main cabin. Scary stuff! 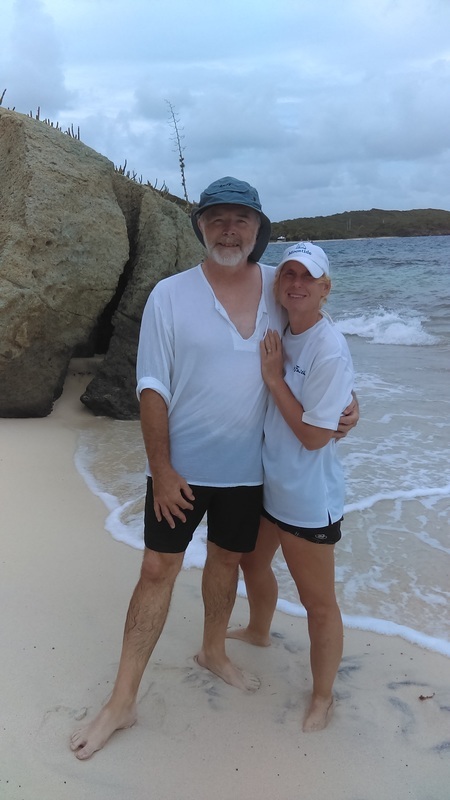 After so many years of boat rebuilding, Gabrielle and I have agreed upon the "10-foot Rule" of boat appearance -- if it looks good from 10' away, we're happy. The thing about the windows is, if it gets installed at a funny angle, it looks bad a half a mile away! So we moved slowly, sweated vigorously, and, well, we think they look pretty good! 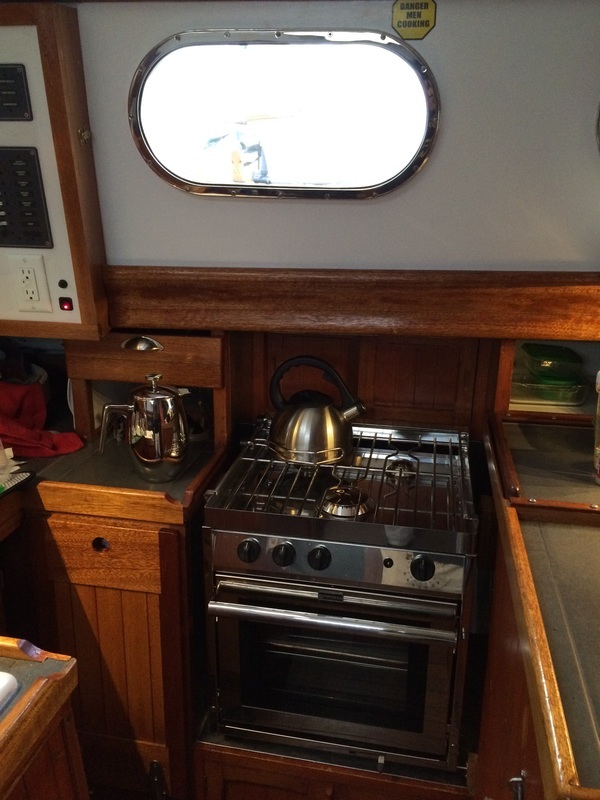 Now, with windows installed and a new Force 10 stove in our galley, we can do some Spring cleaning, clear away the Winter grunge, and prepare to do a little sailing! and Moontide is ready to go! We will keep you apprised. Multnomah Channel from Pirates Cove. Portentous skies. Spring is in the air here at Pirates Cove -- or is it just rain? Perhaps a little of both wafts in to us under the tarps shielding Moontide, as we huddle and cuddle and listen to the droning wetness pouring down on us. 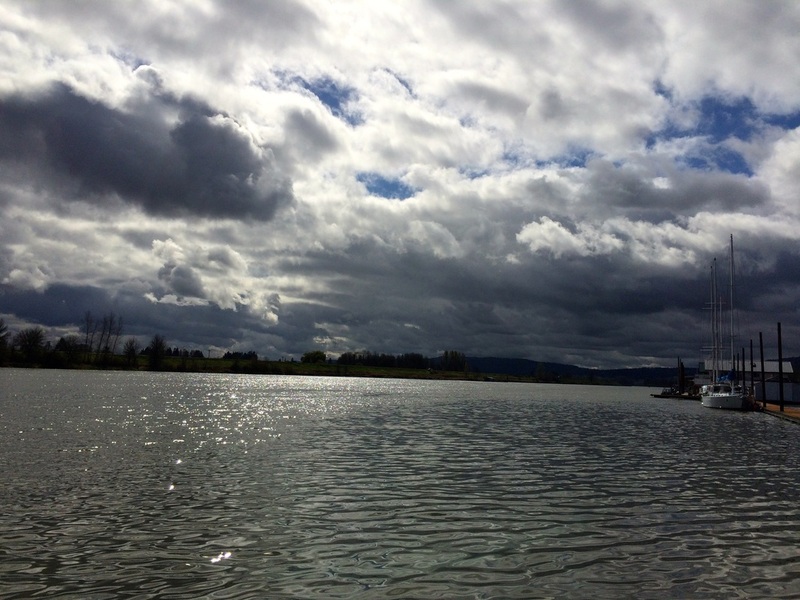 The dry winter is trying to make up for lost time in the Northwest with squall after squall of blustery rainstorms sweeping over the boats in our little marina. Time for indoor projects... maybe catching up on a little reading. Though not particularly traditional, note that the new acrylic hatch does compliment the original acrylic hatch on the forward cabin. 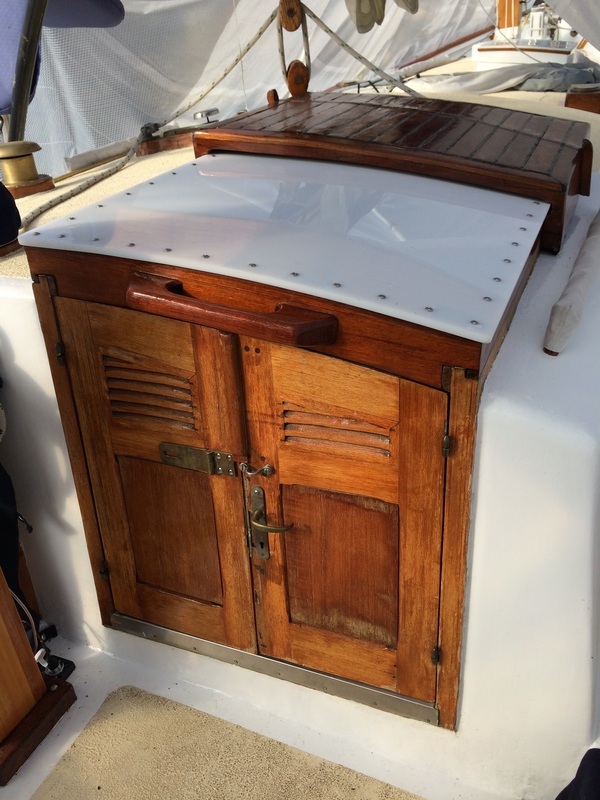 We rebuilt the sliding hatch for the main companionway, replacing the original teak striped lid for a sealed acrylic top. Gabrielle spent most of the Winter rebuilding the original 'turtle' or 'garage' for the sliding lid (see above), but we both agreed that the labor/time vs result on the lid itself made it worth updating our options. An added benefit is the light the acrylic lid gives to the galley. Now I just gotta do something about those doors!!! Another outside project finished, thanks to the tarps, are the sealed lids over the propane tanks (or saddlebags, as we call them) by the steering box. 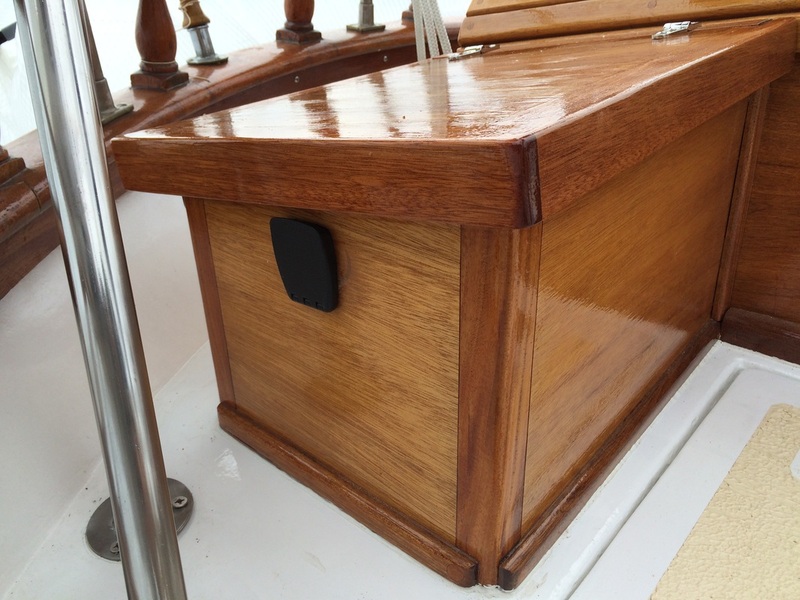 The propane canisters can be latched or locked into place with a vent exiting out the transom. It is aesthetically more pleasing to the eye, and considerably more comfortable to the bottom than sitting on top of the tanks! 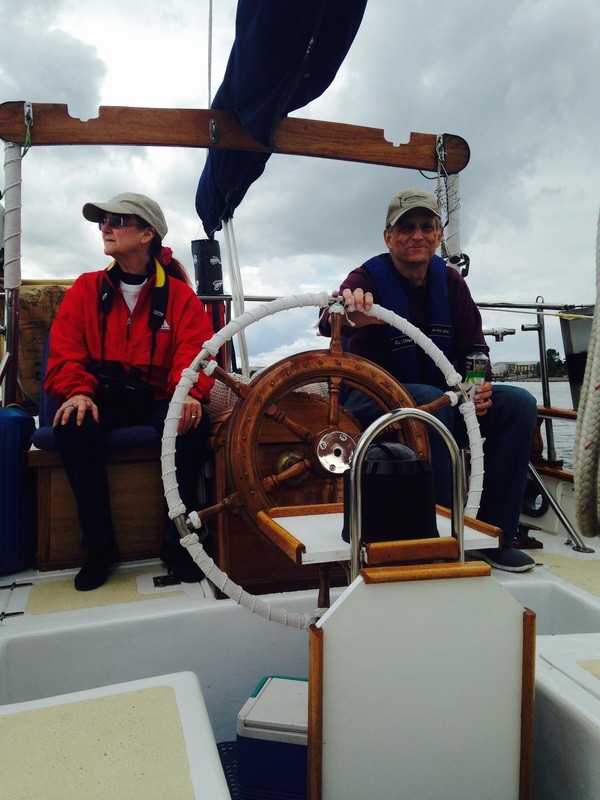 Those of you kind enough to ride with us on Moontide last Fall know exactly what we mean! 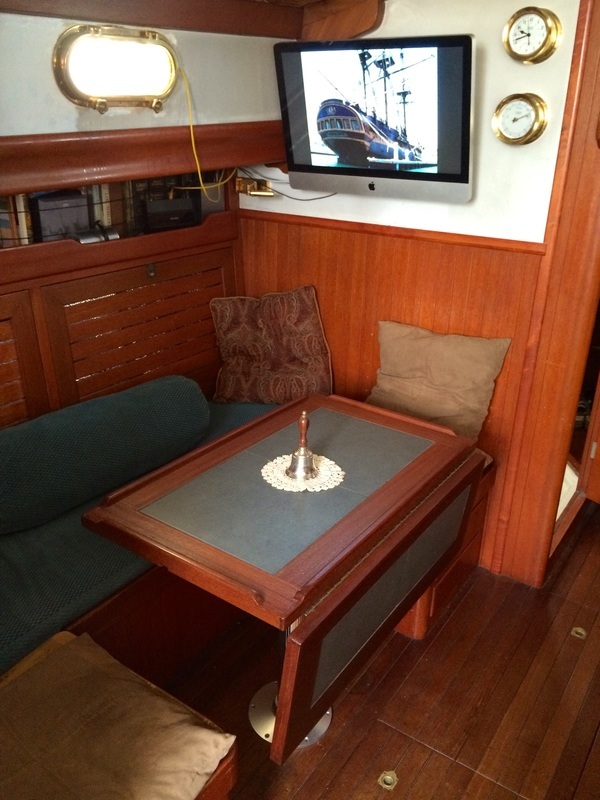 Note the Captain's Table Bell, a gift from Captain Quicksilver (Mark Heimann) of Royaliste fame. An indoor project that we've been meaning to do, and finally completed this month, is the repositioning of the saloon table to allow seating on all sides. Special thanks to Kim Winkler at Columbia Marine Exchange for locating the table parts that now allow us to slide the table in and out for more comfortable and accessible seating. Boat life and Marina Life is a microcosm of our larger world -- people move in or move on, relationships are fostered, or lost to conflict. Owners legislate. Rebels isolate. The rest of us try to mediate. Illness comes and goes. Puppies are born. Friends die. 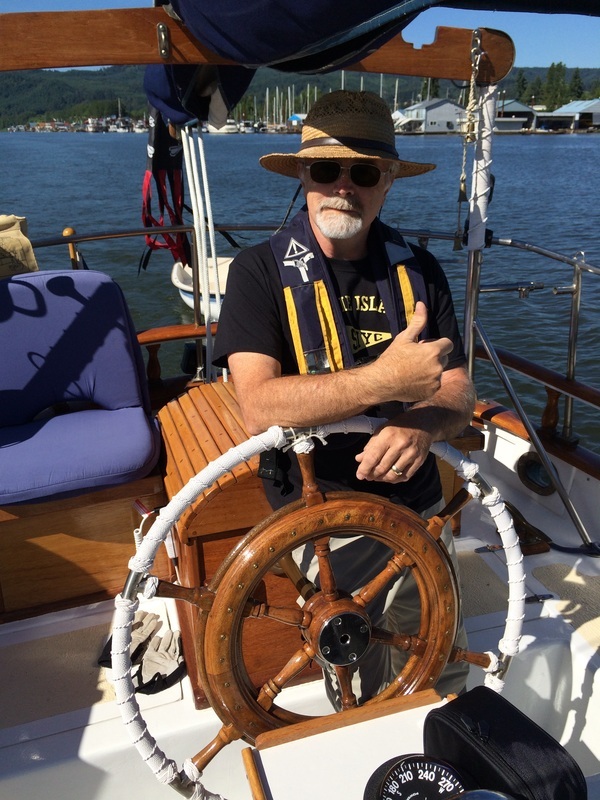 We take a moment to Remember Roger Wenzel, a neighbor, friend, and boat builder, who succumbed to cancer this month after years of battling with it. Our hearts go out to all the folks who cared for him. He is missed. That's about all we have new to share from the Wobegone branch of Multnomah Channel for now. Here in the Northwest part of the country, we have had an amazingly mild Winter. 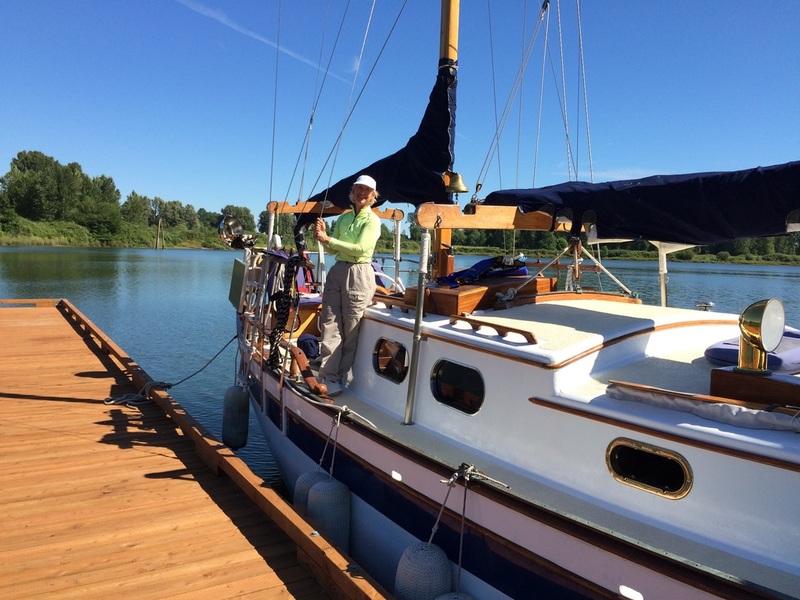 To many Oregonians, this portents an ill Summer -- drought, disease, famine -- but for us, we're grateful just to have had such amazing weather for doing boat work! 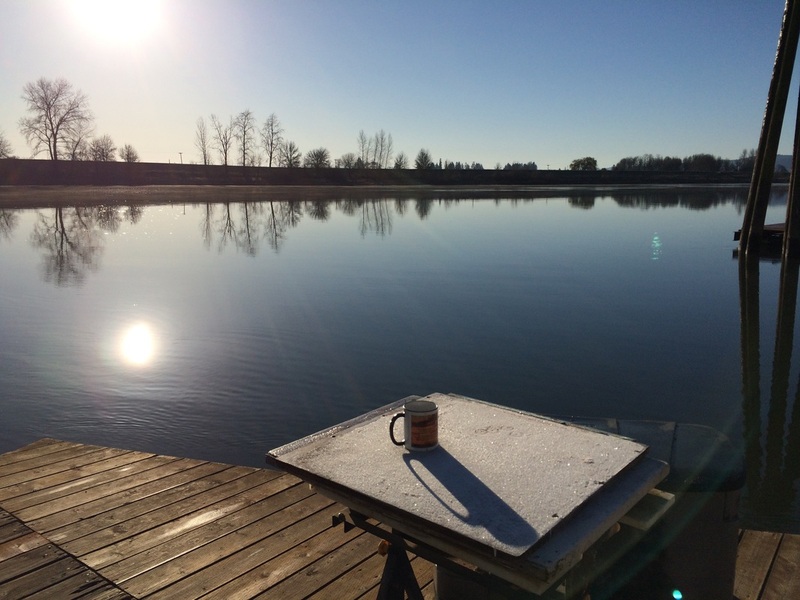 March 1st started with crunchy cold docks, but warmed to almost 70. And it had nice days all around it! 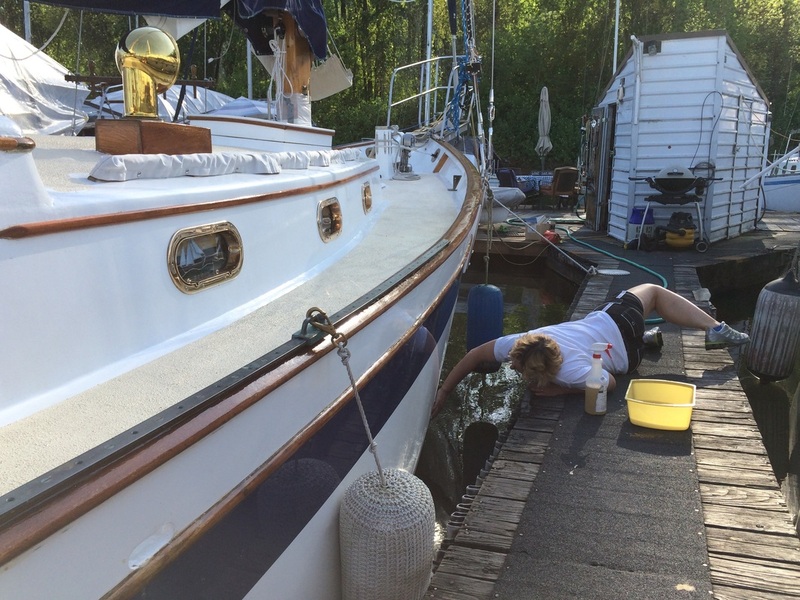 The last couple months we've been helping neighbors with their boat projects, interspersed with some Moontide tasks that we're still working on. These include: lids for the propane tanks in the aft cockpit, repair of the main hatch (nasty leaks), a new pedestal for the dining table in the saloon, and insulated ceilings in the main cabin. Building box lids for the propane lockers. 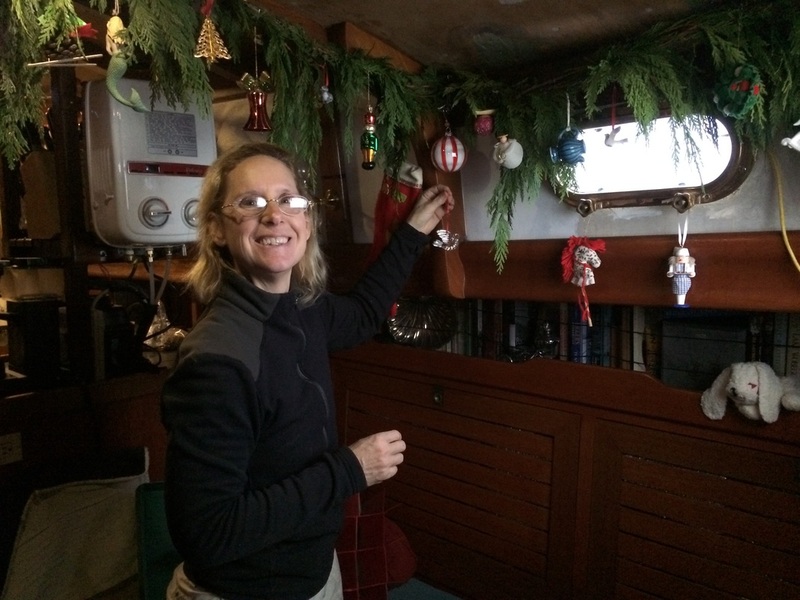 Gabrielle is certain we have gremlins on the boat-- happy gremlins, it seems -- because projects seem to be working out just the way we plan them. We're determined not to let it go to our heads... but we want to get lots of projects done while the luck lasts! Oh, yes. Happy St. Patrick's Day! "How do you manage that?" 2014 was a tough year for many of us, with both painful losses (Family deaths and illnesses) and some hard-won gains (sealed decks and stepped masts) and, frankly, we are glad to be shed of it with the hope and goal of a great 2015! 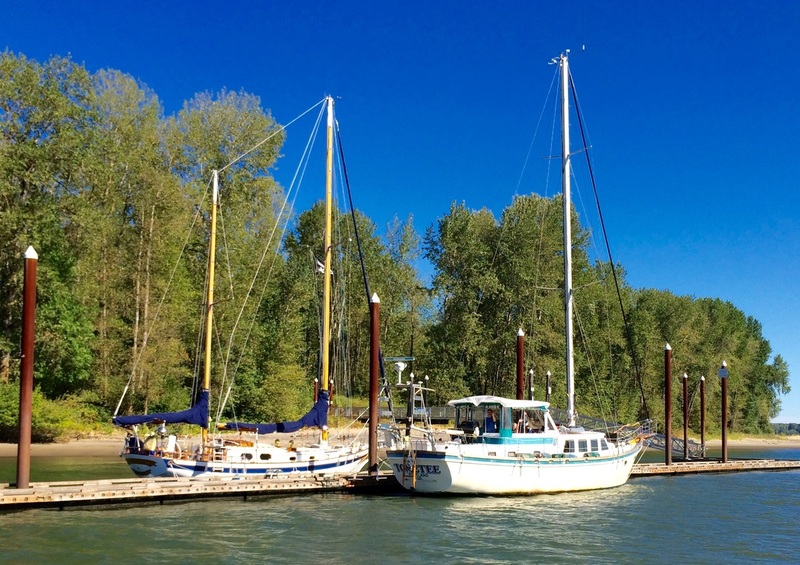 Many folks we know (landsmen, mostly) wonder at how one deals with the sundry challenges of getting by on a boat with living space of less-than 500 square feet. Fortunately, Gabrielle and I rather like each other, so that helps! It can be 'intimate' at times, especially during winter months when our effective living space is cut in half (the upper deck is not too livable in ice and wind and rain ) and dampness seeps into everything. Even though we live in a space too small for a Christmas tree, we manage by making the whole saloon a Christmas tree. This year we hung garlands of cedar from the ceiling, and decorated it with our old tree ornaments. It was very festive! One learns to work with what's available. 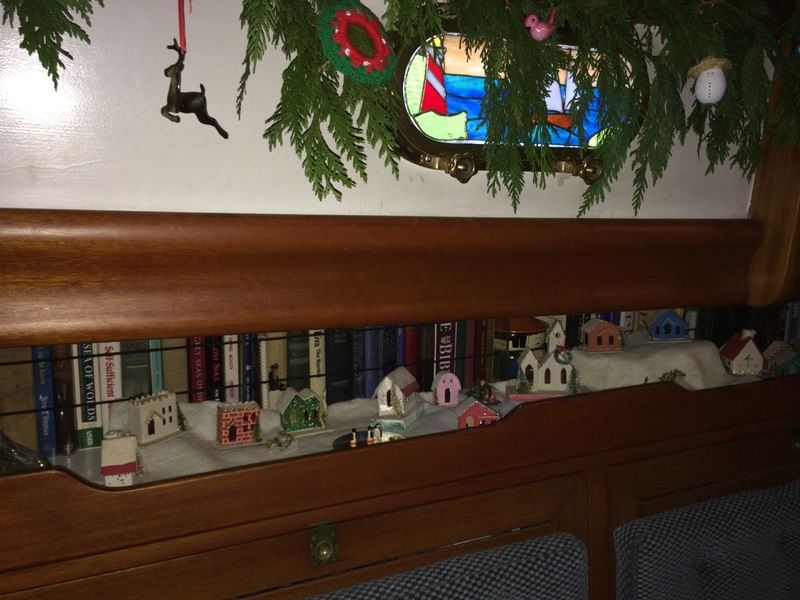 Like a little space around the book case! 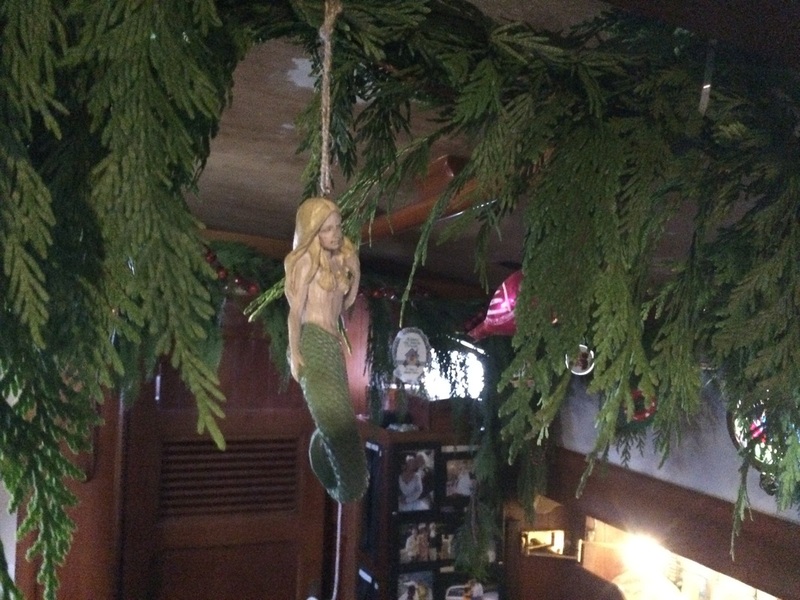 No Christmas ornaments are complete without mermaids! From the Moontide Crew, we hope that the New Year may be kind and Generous to all of you! Note the empty space where Moontide sat for the last three years... Huzzah! Okay, they're up. Now what? 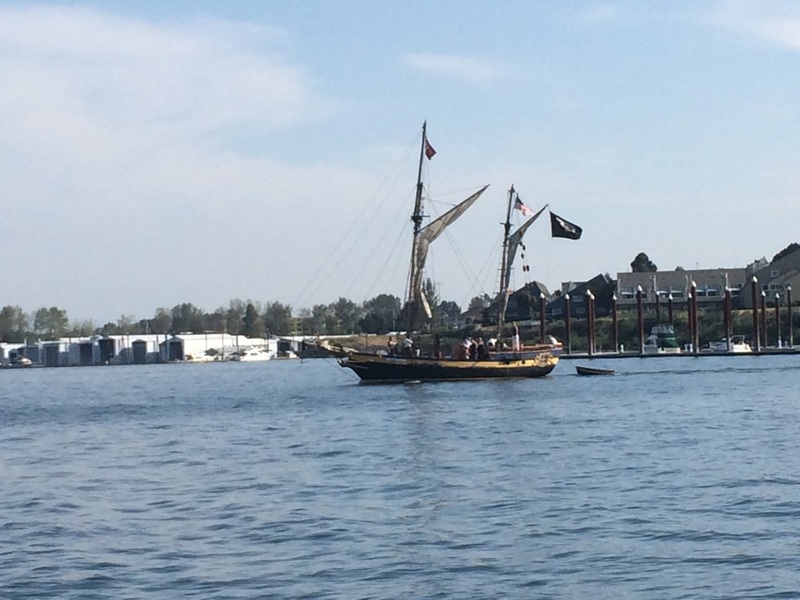 On September 18th, we motored from Pirate's Cove to Hayden Island Marina on the Columbia, giving MT her first real excursion since 2011! 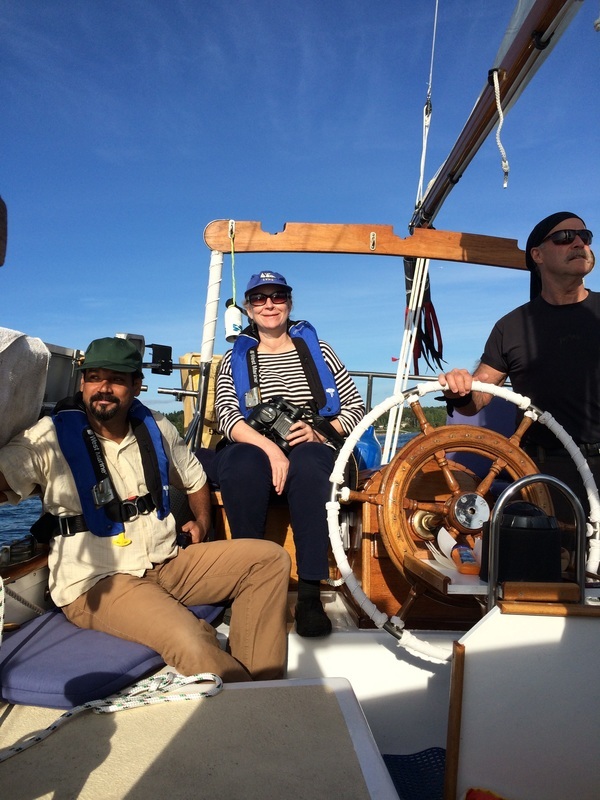 Crew included Skipper Michael, Admiral Gabrielle, Helmsman Fred Pfhaler, and able-bodied sea-persons Kim Caron, Hans Kerstetter, and Allison Bennett-Rice. 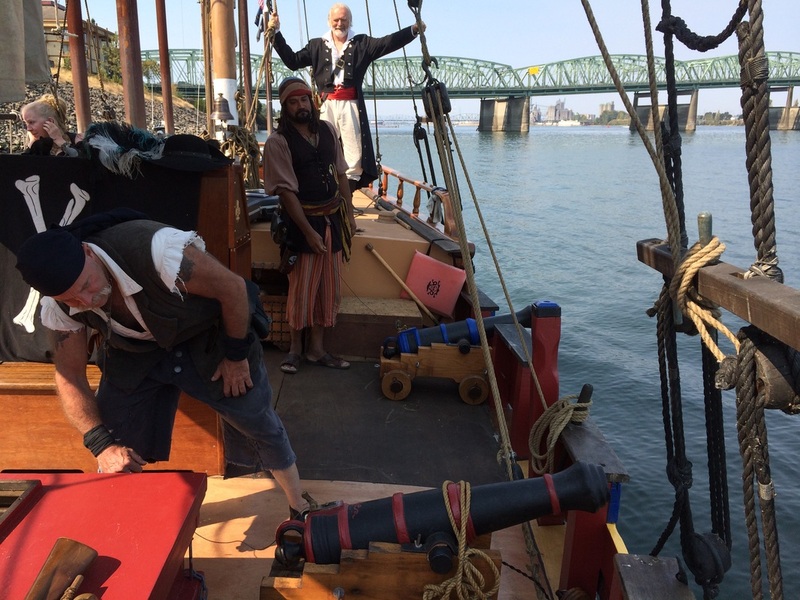 Clearing the Multnomah Channel and beginning our run down the Willamette, we raised sail with great expectations. 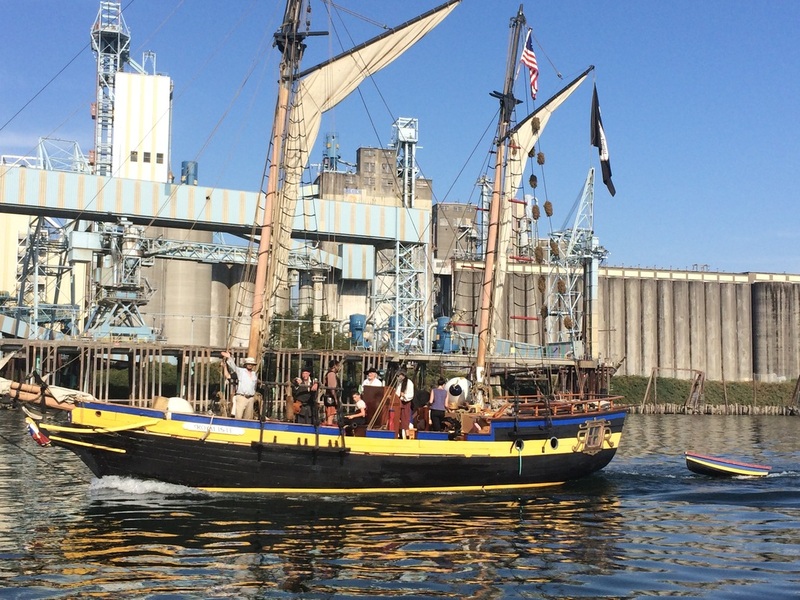 Genoa loosed and unfurled! 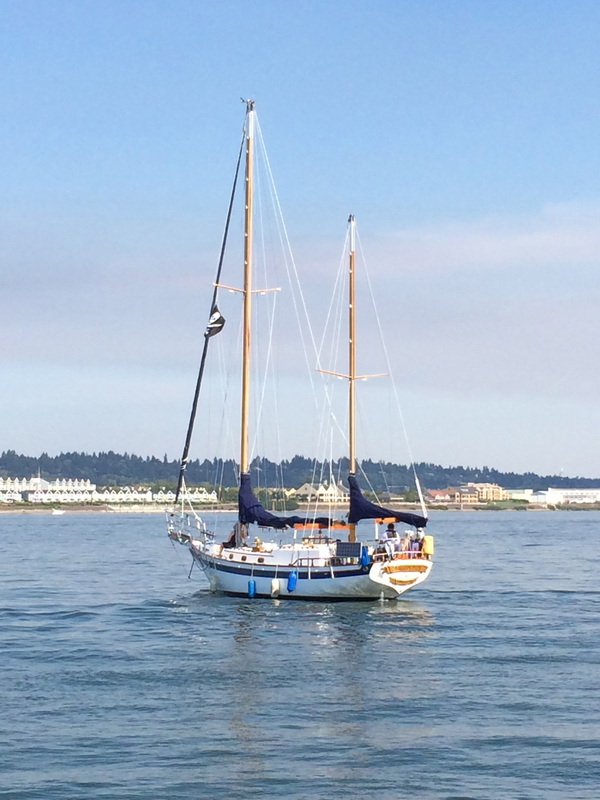 Mizzensail hauled away! Every-thing looked good. But there was no wind. Nil. Nix. Nada... Alas. 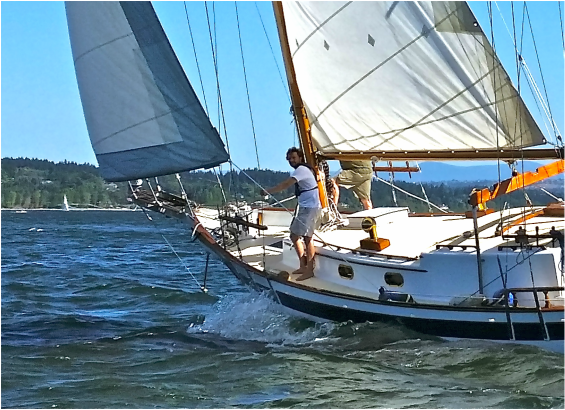 So, we left everything up, and practiced tacking a few times while under power, in hopes that a breeze might stir out on the Columbia. "Pretend there's wind, and the boat's heeled over. We're headed for the bank there and we need to turn..."
Fortunately, our crew had great imaginations, and joined in the exercises wholeheartedly. 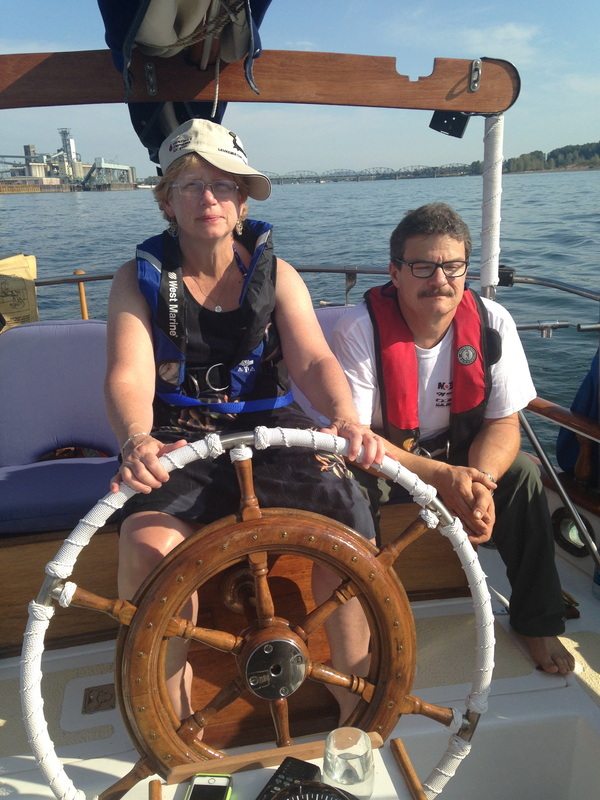 Allison and Fred 'hang on' as Kim hauls in on the port jib sheet! No wind! 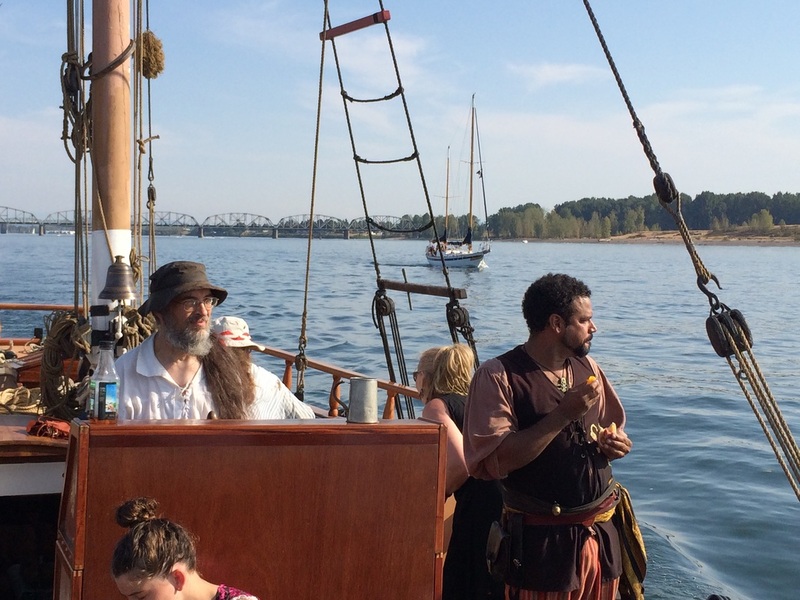 We turned west on the Columbia River and motored downstream for almost an hour, hoping to actually sail, but apparently neither Zephyrus, nor Favonius felt inclined to oblige. 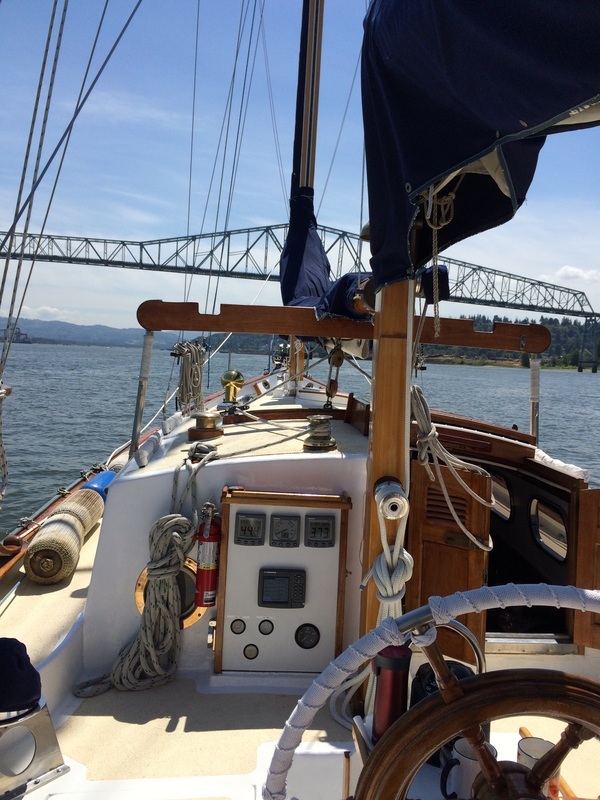 As the afternoon grew long in the tooth, we turned back upstream, past the Willamette, had a pleasant swing past the railroad bridge, passed under the I-5 bridge and docked at Hayden Island Marina. All in all, an uneventful voyage. Not a bad thing, for the first time out. 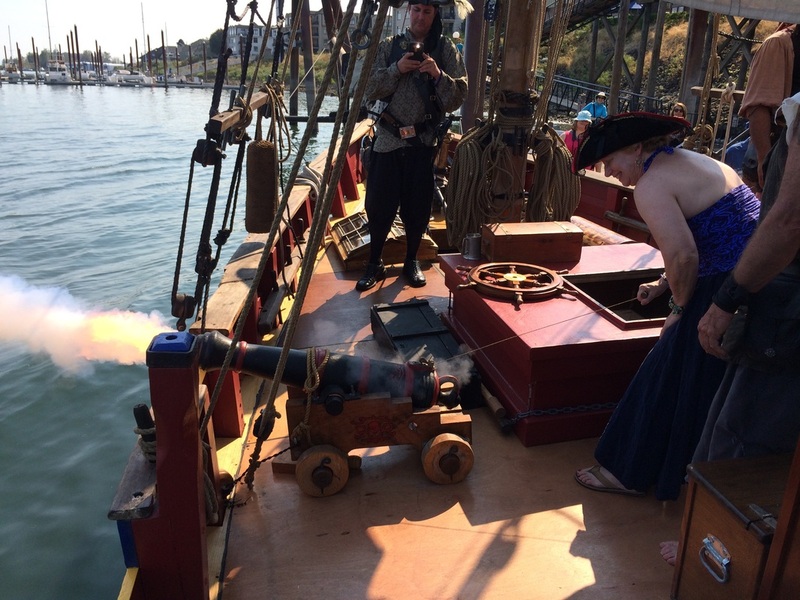 Now, time for OWSA parties and Pirates! Yar! The boat is ALMOST ready to sail. Funny, we thought once the masts were on, it would be a piece of cake getting Moontide back into sailing trim. 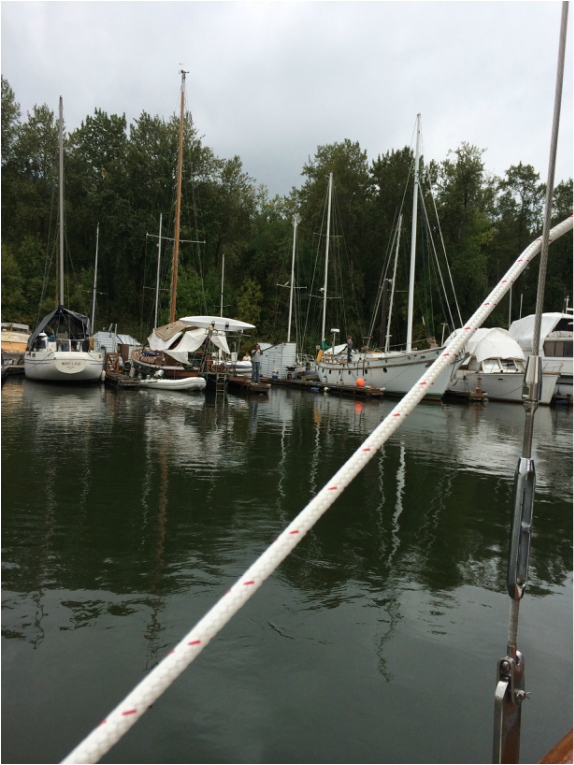 But we failed to consider that we have two completely different masts stepped onto the deck now, and how each line of running rigging attaches to the boat is a whole learning process. 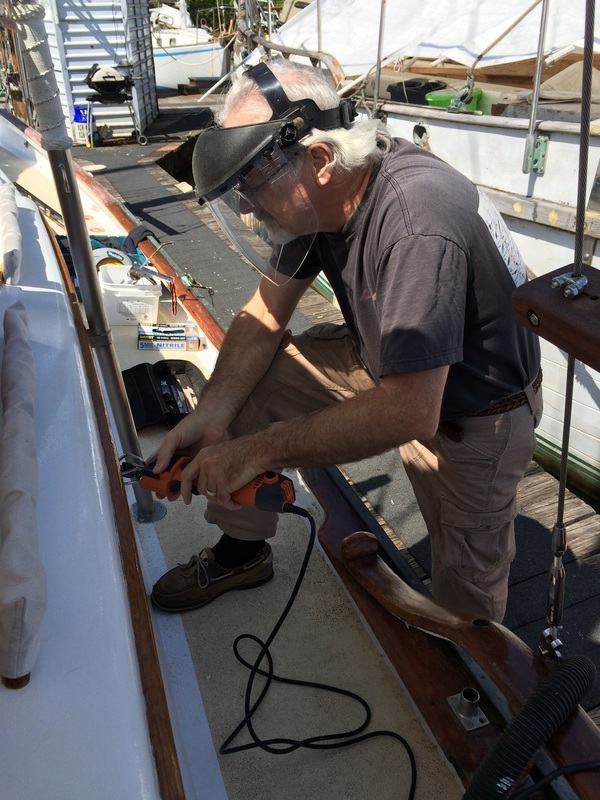 Outhauls, downhauls, topping lifts, reefing points, sheet winches, wire connectors, fairleads for the sailing sheets, cleats -- all have to be built onto the masts... in appropriate locations. 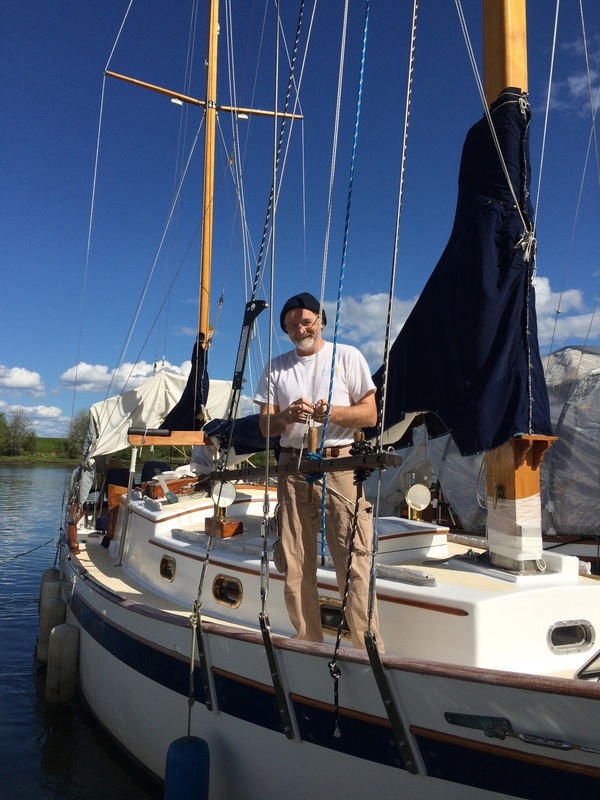 One doesn't want to promiscuously drill holes into one's shiny new masts, does one? 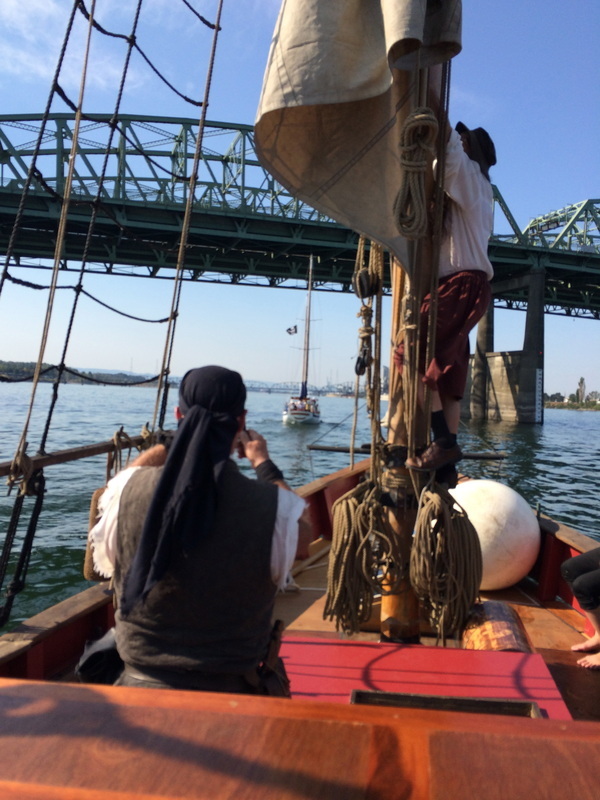 Looking at photos of the old masts, then standing on deck and making fools of ourselves simulating the movement of working lines to see where things will work -- it gets to be mind boggling!! 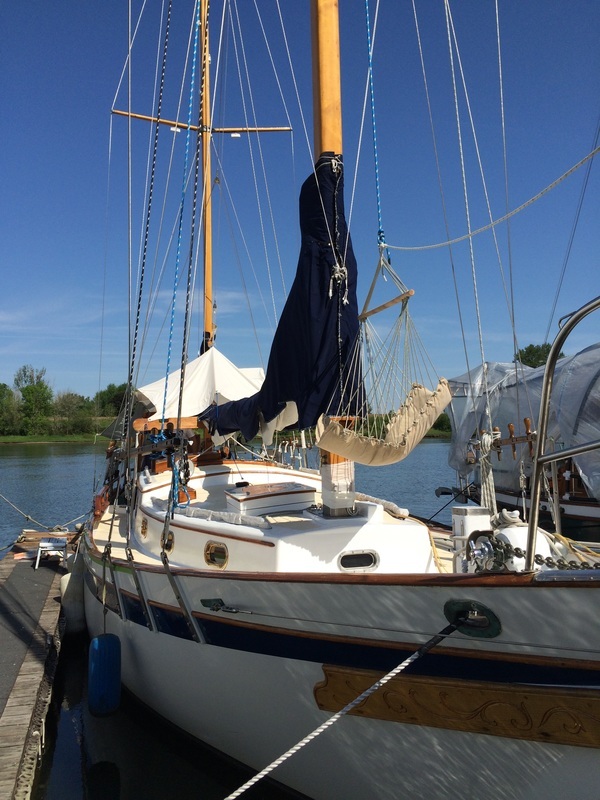 But, two sails are on: the genoa roller furling, and the mizzen. The main is on-again-off-again as we work out where everything goes. 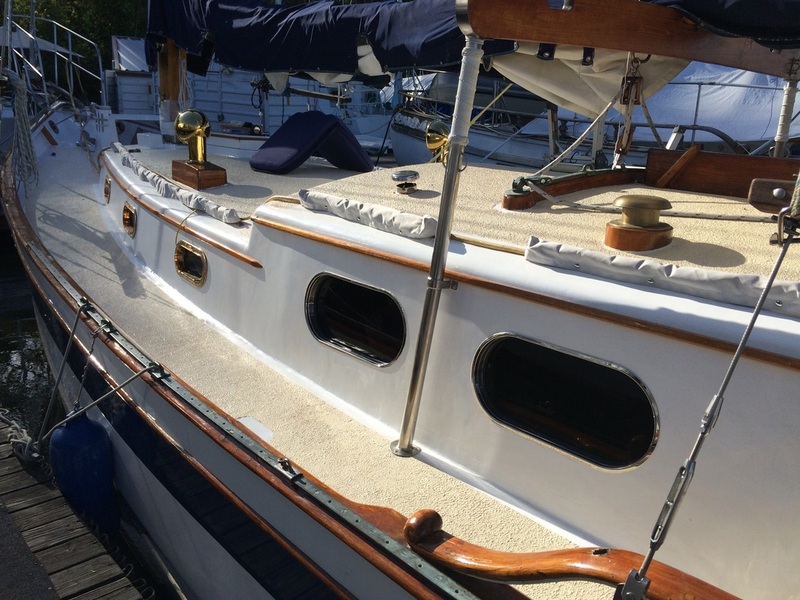 Can't run blocks for the reefing points until the outhaul is set, and I can't set the outhaul cleat until I figure out where the reefing blocks go! How does anyone actually ever figure this stuff out?!?!?!? First view of the water tank. Yecch! On the Bright side, after assiduously analyzing the problem, utilizing our best collective deductive reasoning, scrupulously researching, photographing and weighing what could possibly be causing the leak in our bilge, we concluded that the only feasible source of leakage could be our fresh water tank. For eight months, we have carried bottled water onto the boat, avoiding putting water into the tank. 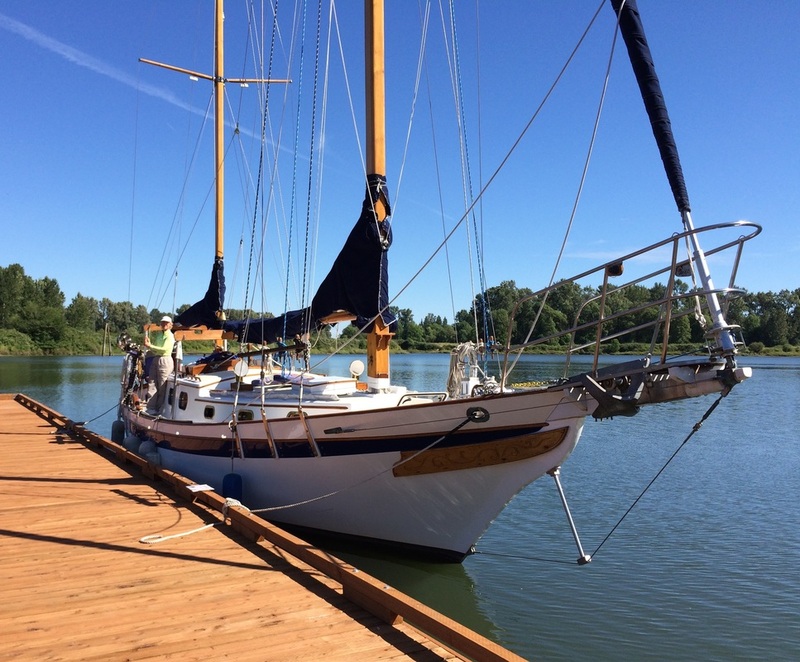 Gabrielle has carried dishes to the restroom down the dock to wash them in a good natured way... getting the masts on was our priority. The bilge has been dry. 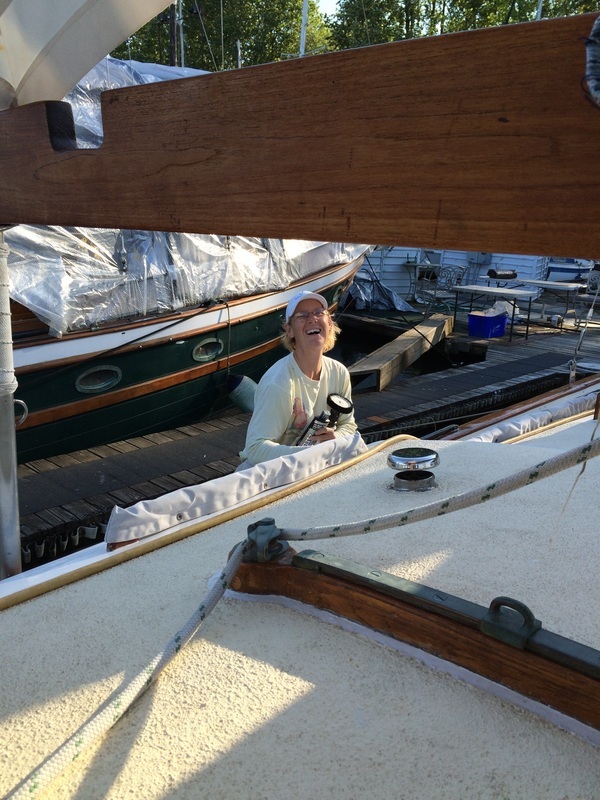 But with the masts on, Gabs tackled the water tank problem while I continued working on deck. 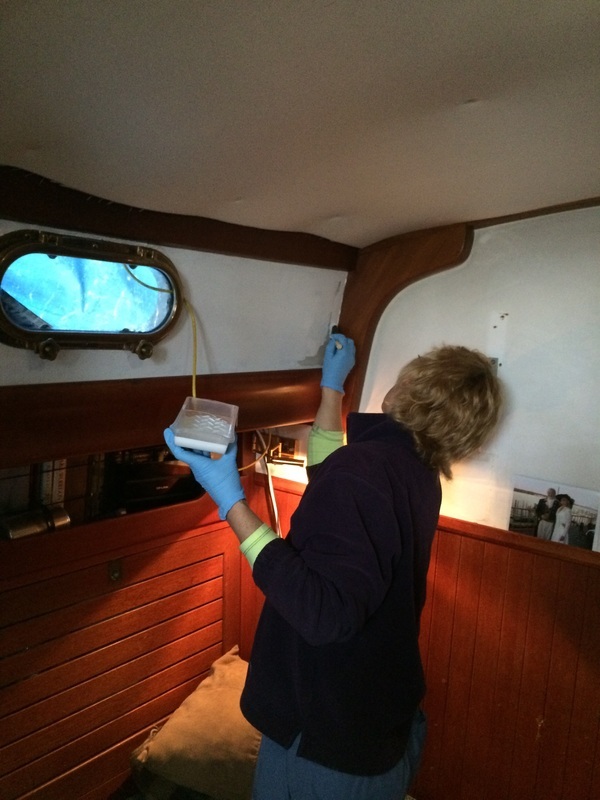 Since the water tank is fiberglass and integral to the hull, She extensively researched ways of patching it from the inside, and decided to go with epoxy. First we cut 2 new holes in the top of the tank and installed access lids on them. Then she cleaned out the inside of the tank. Towel dried, then cleaned it again. Let it air dry for a week or so. 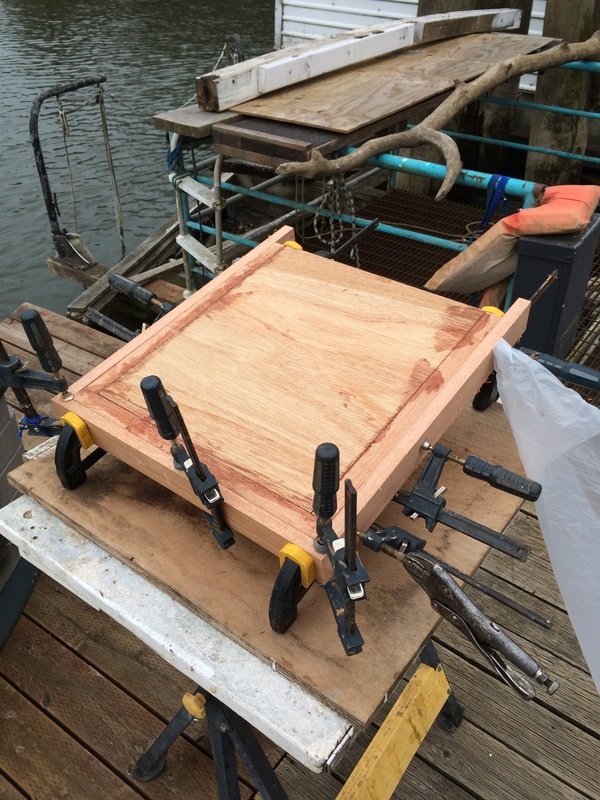 Just to be sure, she applied 3 coats of epoxy to the bottom and sides. No easy feat, believe me. Next step: wash out the amine blush. 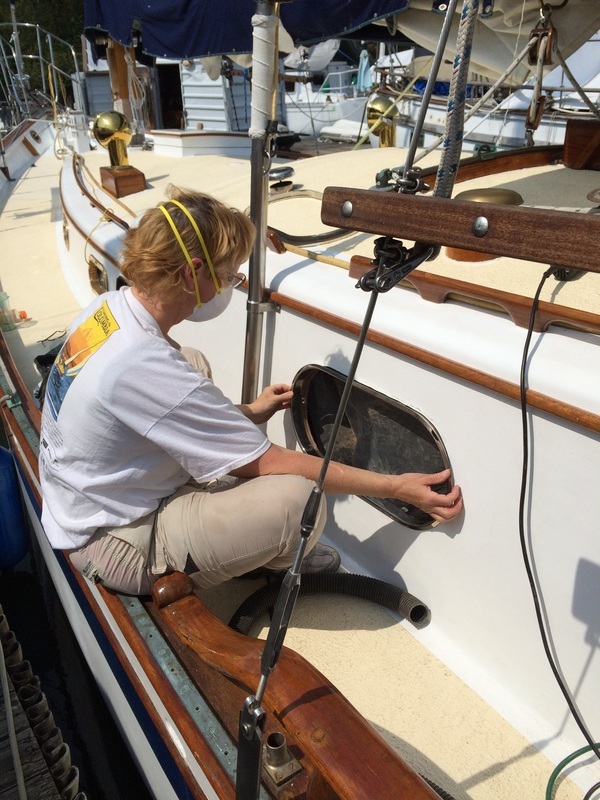 She filled the tank with water, scrubbing the new surface with a bristle brush as it filled. With 110 gallons of fresh water back in the tank it was time to test systems. "Water preasure on" Check. "All faucets opened." Check. The tanks had to be flushed twice before use. It was on the second flush that Michael peaked into the bildge to find ... WATER! Somewhere on this fool ship we still had a water line leak. " Bloody hell!" was all I could think as months of packing water onto the boat and dishes off rushed back to my memory. Moontide, like a petulant 2 year old , has a way of eliciting reactions from her people. Once our emotions settled logic emerged. In the restoration pages we detail the art of finding the leak but suffice to say the actual leak was from a tiny imperceptible hairline crack around the grey water outlet. A couple bottles of different food coloring and my being perched atop the tanks for hours to detect an errant drop of water lead to the true cause. This was Michael's initial thought but an optical illusion deceived us early on as we traced the leak. Once the true source of the leak was isolated , Michael made quick work of repairing it. Again we tested the systems and this time, all was dry. This confirmation was not a minute too soon. 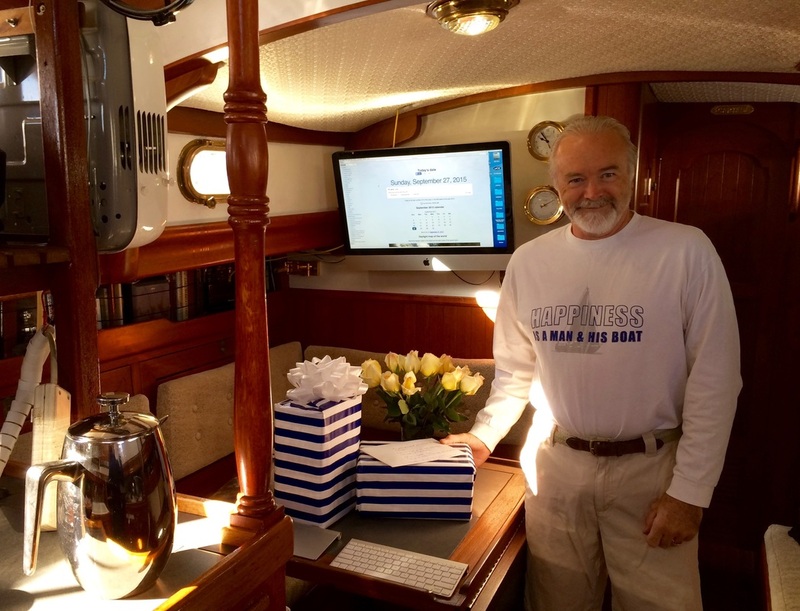 My dear Michael was left with the task of ensuring all was working and dry as I raced to the airport to collect my sister, Kim who was traveling in from R.I. for a visit... and yes, she stays on the boat. no running water would have erased all doubt.